The UN Human Rights Office and Amnesty International are calling for a probe into exactly how Muammar Gaddafi died. New authorities say the burial of his body will be delayed so the investigation can be conducted. ­Concerns over what may be an unlawful killing of a prisoner were raised after the former Libyan leader was shot to death in his hometown Sirte, which anti-Gaddafi forces captured on Thursday. The circumstances of the death are unclear. 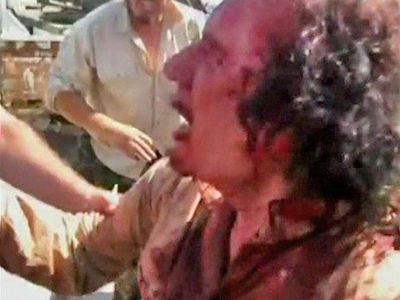 Amateur video footage suggests that Gaddafi was captured alive. A post mortem examination of the body also confirmed that Gaddafi was alive at the moment of his capture, said Dr. Ibrahim Tika, who performed the procedure. "Gaddafi was arrested while he was alive but he was killed later. There was a bullet and that was the primary reason for his death, it penetrated his gut," he told Al Arabiya television. "Then there was another bullet in the head that went in and out of his head." 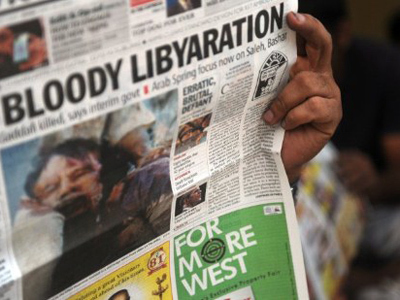 Different versions of what happened next have been voiced by the new Libyan authorities. Initial reports said Gaddafi was beaten and shot dead by an 18-year-old National Transitional Council (NTC) fighter Ahmed Shaibani. Later, another version was voiced by the NTC, which says the convoy, which was taking Gaddafi to Misrata, was attacked by loyalists, and the colonel was killed in the firefight. "It is unclear how he died. There is a need for an investigation," UN Human Rights Office spokesman Rupert Colville told a media briefing in Geneva on Friday. "It is a fundamental principle of international law that people accused of serious crimes should, if possible, be tried. Summary executions are strictly illegal. It is different if someone is killed in combat," he told Reuters Television. The statements are mirrored by an earlier statement by Amnesty International, which said the revolutionary forces must provide a full account of the events which resulted in Gaddafi's death. The London-based rights group said Thursday it was essential to conduct "a full, independent and impartial inquiry to establish the circumstances of Colonel Gaddafi's death." 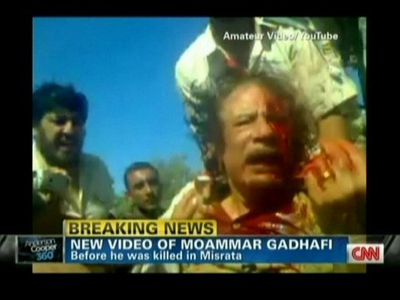 Muammar Gaddafi's motorcade was stopped from leaving the fallen Sirte by a NATO air strike. The wounded former strongman was then found by the attackers of the city. His son Motassim was with him and is also now dead. “What we saw on all international channels was shocking, hideous, compelling and unexpected. It does not represent Muslim customs, nor the Arab dignity and humanity. The NTC bears the responsibility for that alongside those who actually killed Gaddafi,” he said. He added that from the very beginning it has been reported that the armed rebels violated international law in the way they treated their captives, the prisoners of war. “They tortured and killed them. NATO gave a blind eye to such violations of international law, so it also bears sort of responsibility,” he concluded. Besides violating the law Gaddafi’s murder shows the lack of control in the country. The National Transitional Council let the rebels murder the Gaddafi as if they had no power to hold them, suggests Lajos Szaszdi, a political analyst and visiting fellow with the Heritage Foundation from Washington. “The two killings [of Colonel Gaddafi and his son Mutassim] demonstrate the NTC has only nominal control of the rebels, and those people who were at the scene acted seemingly freely,” he told RT. Moreover, the reprisals against the Gaddafi loyalists may not end with the death of their leader. The rebels may now aim their anger at the mercenaries still remaining in the country, as well as at other Gaddafi supporters, the expert added. This can only push the country into chaos, but is it inevitable as the NTC cannot control the rebels, continued Szaszdi. Even if the UN investigation takes place and the real murderers of the toppled leader are caught, nobody is going to be convicted for that gruesome murder, the analyst argued.